This is the most recent information about Sue Thompson that has been submitted to amIright. If we have more information about Sue Thompson, then we provide a link to the section where it appears (the actual page whenever possible). 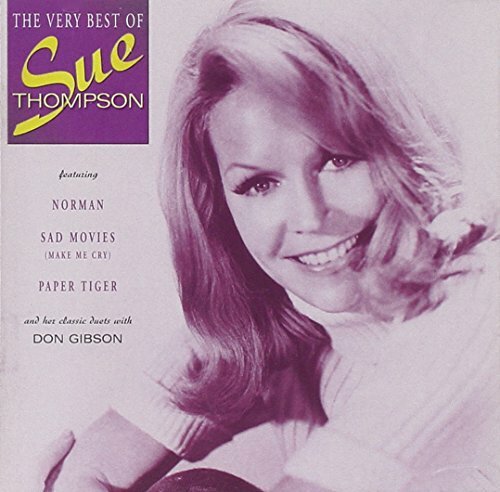 "Sad Moves (Make Me Cry)" originally "Sad Movies (Make Me Cry)"
"Paper Tier" originally "Paper Tiger"
"Paper Tigger" originally "Paper Tiger"
"Pamper Tiger" originally "Paper Tiger"
"Paler Tiger" originally "Paper Tiger"
"Piper Tiger" originally "Paper Tiger"
Remarkable tiger, that can play pipes! "Sad Movies (Make Me Try)" originally "Sad Movies (Make Me Cry)"
"Sad Movies (Make Me Fry)" originally "Sad Movies (Make Me Cry)"
And in the middle of the color cartoon I started to cry. Cartoons aren't shown before movies anymore. "James (Hold The Ladder Steady)"
James, James, hold the ladder steady. James, James, I'm packed and I am ready. "Great Piper" originally "Paper Tiger"
"Grip Pet Ear" originally "Paper Tiger"
"Peer At Grip" originally "Paper Tiger"
"Grip Tree, Pa" originally "Paper Tiger"
"Pipe Grater" originally "Paper Tiger"